A rare and unusual hand hammered copper tea caddy with the M date letter for 1880 by the Gorham Company. 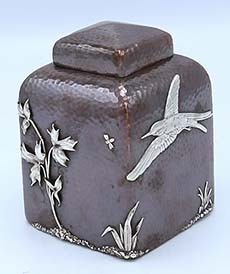 Applied silver Japanese motifs including birds and plants with leaves. The surface has the original shiny patina and the interior and the pull off cap have the original bright gold wash. Height 4 1/4". 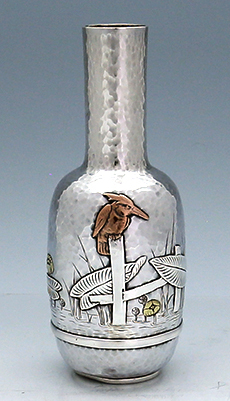 A Tiffany mixed metals and sterling silver hammered vase with two copper kingfishers and applied silver lily pads in a Japonesque influenced scene. Engraved highlights simulating aquatic plants and ripples in the water. An earlier example dated 1876 with fine hammering throughout. 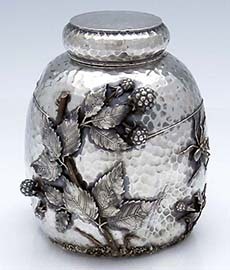 A three sided antique sterling hammered and mixed metals tea caddy with pull off cap. Applied with copper and silver insects on the body and the lid. French control touchmark. There are three applied low profile feet on the base. The three sides each have tree and vines applied in mixed metals. Whiting mark rubbed but visible. Circa 1880. Weight 10.15toz. Height 4 3/4". 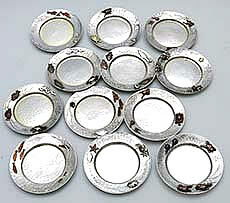 A set of twelve antique hand hammered nut cups with applied mixed metals Japanese motifs. The applied mixed metals motifs include crabs, fish, frogs and tadpoles together with finely engraved marine plants. Monogrammed. Diameter 3". 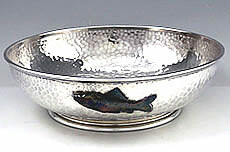 A Whiting antique sterling and applied mixed metals bowl with handles. Spot hammered decoration and acid etched seaweed all probably the design of Charles Osborne. Circa 1883. Lightly gold washed interior. There is a large applied copper crab on one side and a silver lobster with copper eyes on the other. Weight 23.80 toz. Length 12" across handles. Height 3"
A Tiffany antique hammered mixed metals and sterling open master salt. Applied with copper and brass crab and a silver lobster on the reverse. 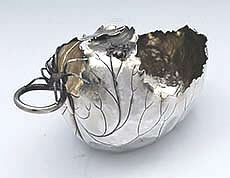 There are additional shells applied in silver and mixed metals. These applications are joined by engraved seaweed. Height 2". Weight 3.05 toz. A Whiting antique sterling hammered pitcher with chased sea shells and a large applied crab with copper shell. The handle is also spot hammered. Weight 28.85 toz. Height 7 1/4". 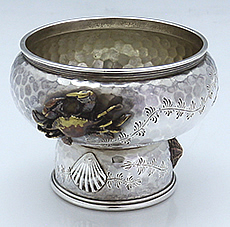 A large antique Tiffany sterling silver fruit compote in the Japanese style with spot hammered surfaces and applied copper spider and bug. There are numerous applied gold peapods and an etched monogram on the base. A rare and important Tiffany Japonesque fruit stand with a large enough presence to be a centerpiece on a table. Measures 8" square. Height 6 3/4". Weight 32.15 toz. Marked inside the base with the Tiffany & Company mark. Circa 1880. 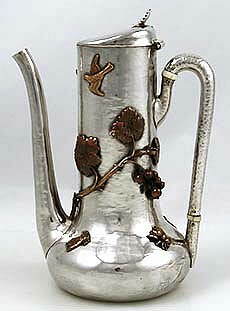 An antique sterling spot hammered coffee pot by Whiting with applied blossoms, a very large bug on one side and two bugs on the other side. There is a copper bug on the hinged dome lid. Engraved plants between the applications. Excellent condition. Height 7 1.2". Weight 11.05 toz. Museum quality. A very unusual antique sterling silver George Shiebler leaf form bon bon basket with applied copper bug and a large hand made spider applied to the handle. Lightly gold washed. Weight 7.45 toz. Length 6 1/2". 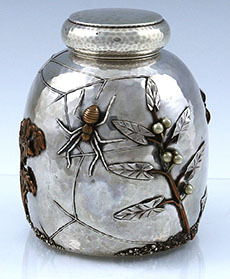 A rare Gorham hammered and applied mixed metals tea caddy with a large applied spider and berries. On the other side is a large intricate spider web with an insect at the center. Deliberate indentations give the tea caddy added dimension. The lid pulls off. The base has a leaf applied with a date of presentation. Circa 1879. Height 4 1/4'. Weight 8.55 toz. 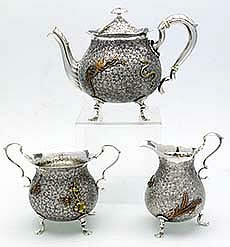 A Three piece antique sterling silver tea set by George Shiebler with applied mixed metals in the form of bugs. The teapot lid pulls off for opening to reveal intact gold wash inside the pot. Height of the pot is 4" to the finial. The teapot has an engraved monogram tucked away on the side. 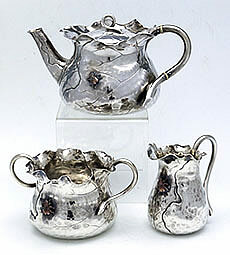 A Dominick & Haff antique sterling three piece teaset with special engraved textured surfaces applied with mixed metals motifs and in pristine condition. Teapot 4 3/4" tall. 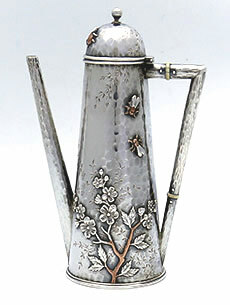 A Gorham antique sterling silver sugar and cream pitcher with applied copper Japanese motifs on a hammered surface. Both pieces have a gold washed interior. Engraved highlights between the applied copper frog and Japanese warrior, trees and butterfly. Combined weight 12.6 toz. Height 2 3/4". Monogrammed. 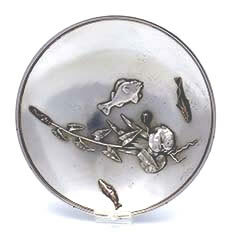 A small 5 1/4" diameter Gorham antique sterling silver bowl on a pedestal ring with applied copper and silver fish and an applied water plant in mixed metals. Weight 4.55 toz. 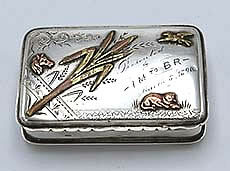 An antique Japanese style sterling silver snuff box by Albert Coles with mixed metals applied including a small copper cat, horse head and bird. Dated and inscribed 1890. The reverse engraved with a group of Japanese motifs. 3" by 2" by 3/4". 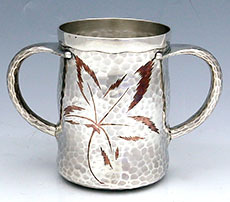 An unusual Tiffany antique sterling silver hammered two handle cup with mixed metal copper inlay of leaves. French import marked. Circa 1880. Weight 16.65 toz. 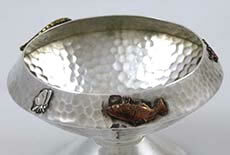 Height 5"
A Tiffany antique sterling spot hammered shallow fruit bowl with applied copper turtles in the Japanese taste. Additional engraved decoration of lily pads on both the inside and exterior of the bowl. Circa 1880. Diameter 8 1/2" Height 2 1/4" Weight 18.8 troy ounces. 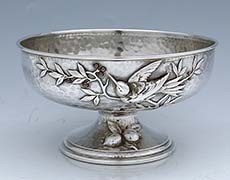 A small antique sterling hand hammered fruit bowl on a pedestal applied with a large bird and branches with copper cherries. A copper bug is applied to the reverse with an engraved inscription dated 1881 from Aunt Alice. Additional fruit applied to the base together with a mixed metals bug. Weight 14.25 troy ounces. 6 3/4" diameter. 3 3/4" tall. An antique sterling hammered tea caddy unmarked but presumably by Gorham and monogrammed on the base. 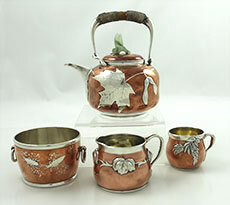 The tea caddy has a pull off lid, a copper tree, mixed metal applied cherry blossom branch applied and a copper spider with silver applied web. At the base of the caddy is an applied retriever with cat tails and reeds together with applied silver "sand" extending along the entire base. 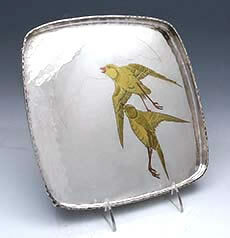 There are two applied silver birds in flight. The spot hammering of the silver caddy varies in size on both the lid and the body. Height 4 1/8". Weight 8.5 troy ounces. 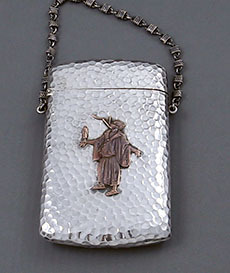 A spot hammered antique sterling silver card case with applied copper figure and bird in the Japanese taste. Ornate original silver chain. The lid opens on a hinge. Circa 1870. Marked on the lip of the card case Gorham logo sterling and other metals. Closes tightly and in excellent condition. 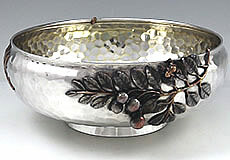 A Gorham antique sterling hand hammered fruit bowl with applied mixed metals. Motifs include a large dragon fly, bird and a large impressive branch bearing fruit with small applied frog. Weight 16 troy ounces. 8" diameter. 3 1/8" tall. A hand hammered Japanese influenced fruit bowl with applied copper fish and applied silver lily pads on the reverse. Marked on the base with the Whiting logo and sterling. 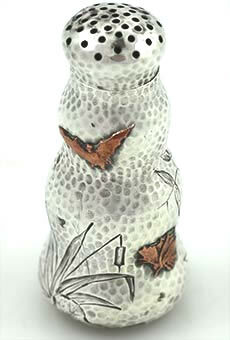 Diameter 9" Height 2 5/8". Weight 21.15 troy ounces. Circa 1880. 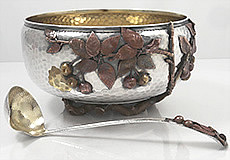 A large important hand hammered Gorham sterling and mixed metals punch bowl. Applied copper and brass cherries and leaves. Matching ladle. Click on picture for more details. 77 troy ounces. 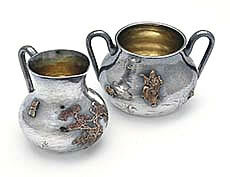 A pair of sterling and mixed metal footed open salts with silver and copper applications, different on each one and depicting butterflies, salamander, fish and a bronze worm. Diameter at top opening 2 2/14"; height 1 3/4"; combined weight 3.25 troy oz. Both salts are monogrammed with a single P on the foot. They are marked with style number 1700 and date letter M for 1880. 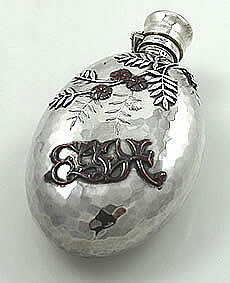 A fine antique hammered sterling and applied copper flask. Engraved highlights and a large applied copper monogram. Two applied silver flies on the reverse with copper details. An additional applied fly on the right upper corner. 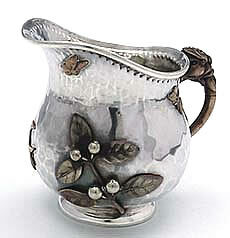 A rare and important Tiffany aesthetic sterling silver with copper overlay and applied sterling oak leaves, iris, ferns and bugs, the lid of the teapot with a jade butterfly finial. The set is composed of a teapot 6 1/2" tall to the top of the handle, a sugar bowl with loop handles 3 1/4" diameter, a creamer 2 1/4" tall and a demitasse cup. The silver handle is wrapped with bamboo as a heat stopper. Total weight 27.50 troy oz. All monogrammed on the underside. All pieces marked with a French import mark. 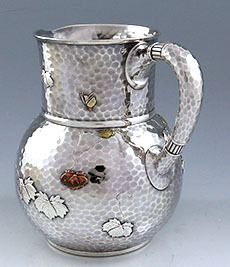 A large Tiffany antique sterling hammered pitcher in the Japanese style with applied mixed metals and sterling. The applied motifs include oak leaves and butterflies. The applications are connected by engraved tendrils on the hammering. Perfect condition. Weight 28 troy ounces. 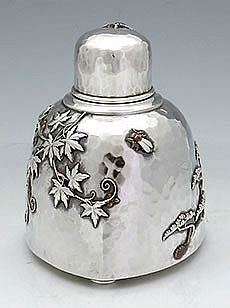 Height 8"
A rare Shiebler single pepper shaker with copper application and engraved leaves. The mixed metals application is of a bat, leaves and a single silver bug. 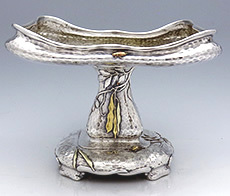 A rare Tiffany hammered sterling and mixed metals tray with a raised edge and applied feet in the Japanese taste. 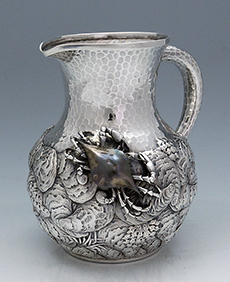 A rare and wonderful antique sterling hammered and chased mixed metals pitcher by Whiting designed by Charles Osborne in excellent condition. 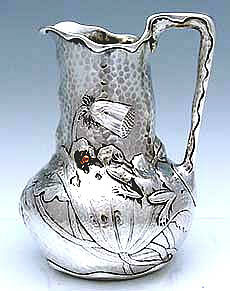 The pitcher has a chased rfrog among the leaves and applied copper bugs with lotus leaves. Weight 32 troy ounces. Height 9"